Pillaiyarpatti is a small town twelve kilometers from Karaikudi, near Madurai, in the Sivagangi District of Tamil Nadu. The town is named after the Ganesa Temple that adorns it. Here, Lord Ganesa is known as Pillaiyar, Tamil for revered and noble son, and ‘Karpaga Vinayakar’, Lord who offers his blessings like the celestial tree Kalpaka whose specialty is ‘ you ask and it will be given’. Pillaiyarpatti temple is an ancient rock cut temple of about 1,600 year old. 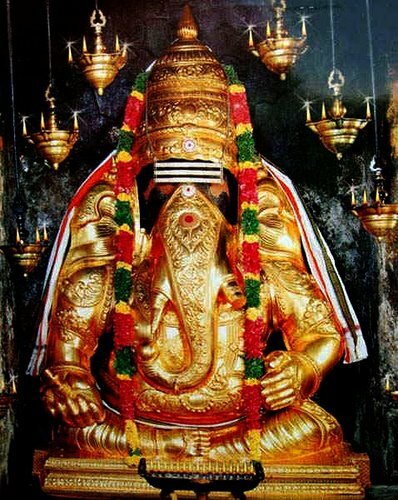 As Vinayagar ( Ganesha in Tamil) satisfies the wishes of his devotees like Karpagam tree, he is also known “Karpaga Vinayagar”. Over 15 inscriptions are found within the temple, that help establish the age of the temple. The Stalapuranam published by the temple classifies the growth of this temple into three distinct stages. It is said to gave built by the early Pandiya kings. This temple is the only one in TamilNadu which deserves pride for having a 6 feet rock-cut Vinayak idol. 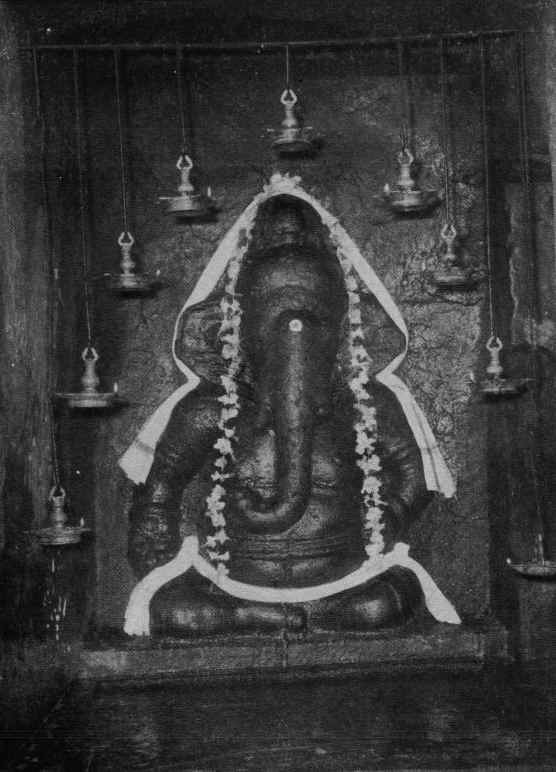 Ganesha were carved out of a stone by a sculptor called Ekkattur Koon Peruparanan who put his signature on a stone inscription found even today in the sanctum. He put his signature in Tamil Language which was in use between 2nd and 5th century AD. It can be concluded that the icon of Karpaga Vinayaka must have been carved around 4th century AD. The deity of this temple is known as “Marudeeswarar” as Marudha tree (In Sanskrit Arjuna Virutcha,Tne Botanical name is Termanalia Arjuna) worship is followed in this temple which indicates that this temple in an ancient temple. The sculpture of pasupatheeswarar, “A cow worshipping Lord Siva by offering his milk” is the special feature of this temple. Also Kuber, the Lord of wealth had worshipped at this temple. Karpaka Vinayakar/ Pillaiyar or Ganesha is the presiding deity here. Unlike other Ganesha idols the speciality of this idol is that Ganesha appears with 2 hands unlike in other places where he is seen with 4 hands and a trunk curled towards his right in the valampuri mode. Devotees worshipping Valampuri Ganesha seated facing towards north, will be blessed with all wealth. Also he is seen seated without Angusapasam ( throne) with his legs folded and stomach not touching the Asana in the form of “Artha Padma” Asanam. The larger inner shrine with its splendid sculptures make the people wonder on the first sight. He does not have Modakam (the most favourite sweet of Ganesha) but a Siva Linga in his palm. He mediates for the well being of the people and so their prayers are answered immediately. This 6 feet tall mammoth image of Ganesha is a bas relief in an excavated cave, off of a hill in the precincts of the temple. A scholar says that Lord Vinayaga is the Lord of wisdom, which is confirmed by the head of elephant in the shape of sacred mantra “OM”. When we draw a line from the broken left tusk, starting upward, then turning left towards right ear and after passing through the bended left tusk up to the tip of trunk, Tamil alphabet “O” appears. The Lingam in the hand indicates the alphabet “M”. Together they form “OM”. This is confirmed by the lord here “Valamburi Pillayar”. Pillayarpatti is situated at a distance of 71Kms from Madurai and 12Kms from Karaikudi on Thirupathoor - Karaikudi state highway. 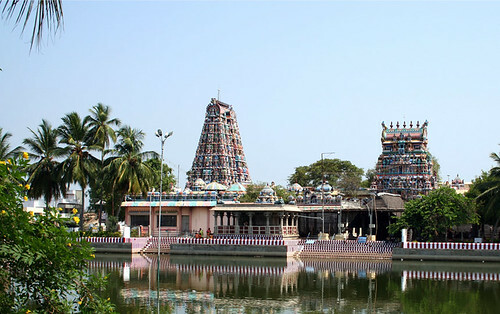 As the temple of Lord Vinayagar is situated in this town, it came to be known as Pillayarpatti. Frequent Bus service available from major cities like Chennai, Madurai, Karaikudi, Devakottai, Tirucirappali, Sivagangai, Rameswaram, Sivakasi, Paramakudi, Theni ,Kodaikanal, Coimbatore, Dindigul, Palani, Pudhukkotai, Aranthangi, Salem, Nagore, Nagappattinam, Bangalore. During Thaipoosam and Sabari malai Sri Ayyappan Festival days (November to January 20) the temple will be opened during Morning 06.00AM to Night 08.30 PM. Around 47 cottages ( including A/C cottages & western toilet facilities ) are maintained by the trust for the benefit of pilgrims. Cottages can be booked well in advance through phone : 04577-264240, 264241, 264182, 264797. Booking Time 7.00 AM To 9.00 PM. Cottage are available for rent only for pilgrimages purpose. Phones: 04577-264240, 264241, 264182, 264797.